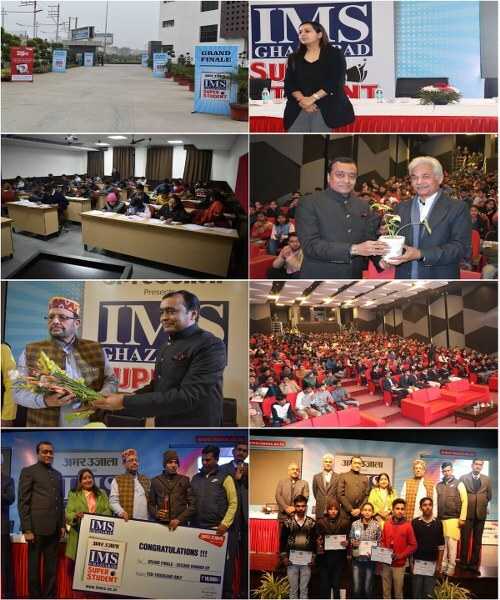 Amar Ujala in collaboration with IMS Ghaziabad(University Courses Campus) organized a "Super Student Activity" for the students of class XI & XII to test knowledge & honor the best brains of Uttar Pradesh & Delhi-NCR. There were multiple rounds during the test, out of which 5000 semi-finalists got selected for the finale at IMS Ghaziabad (University Courses Campus) on 3rd February' 2019. Fifth Position was grabbed by Rahul Singh - Success International School, Meerut. The event was graced in the presence of our Hon'ble chief guest Mr Suresh Kumar Khanna (Cabinet Minister-Uttar Pradesh) , Mrs. Asha Sharma (Mayor-Ghaziabad) , Mr. Yashovardhan Azad (Central Information Commissioner), Mr. C.P Singh (Commissioner-Ghaziabad Nagar Nigam), Shri Rakesh Chharia Ji (Treasurer, IMS Ghaziabad Group of Institutions),and Dr. Sapna Rakesh (Director, IMS Ghaziabad- University Courses Campus). All dignitaries congratulated the winners and other participants for their outstanding performance. They motivated the students to appear in such brainstorming competitions to brush up their knowledge and also wished them a great future ahead.